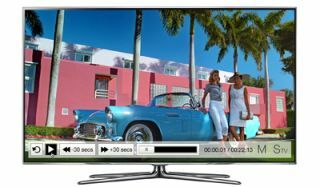 Samsung adds Marks & Spencer app to Smart TVs | What Hi-Fi? Marks & Spencer has become the first UK retailer to launch a Smart TV app for the Samsung internet TV platform. Free and available to download via Samsung's Smart Hub on any Samsung internet TV, the app allows you to browse clothes and other goods, as well as accessing content on lifestyle, food, fashion and technology. There's as yet no option to buy goods directly but Guy Kinnell, marketing director for TV, Samsung UK, makes it clear that this will be available in the future. "The M&S Smart TV app brings new lifestyle content from a trusted consumer brand, as well as giving people a snapshot of how consumers will be able to shop in future," he said. Over 10 million apps have already been downloaded from the Samsung App store, with movie streaming site Netflix another recent addition.